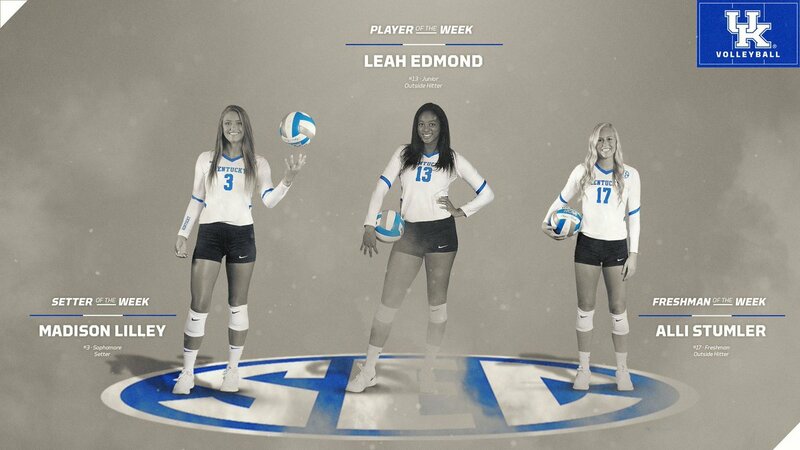 Kentucky’s Leah Edmond averaged 5.92 points and 5.67 kills per set and posted a .391 hitting percentage over two road wins for the Wildcats. With her third of 22 kills at No. 23 Missouri, she became UK’s all-time kills leader in the rally scoring era. Big week for @leahedmond13, @mplilley03 and @AStumler. Florida’s Allie Gregory averaged 6.00 digs per set and recorded zero reception errors over two wins this past weekend for the Gators. Kentucky’s Madison Lilley averaged 13.17 assists per set and helped lead the Wildcats to a .425 hitting percentage on the weekend. She posted her ninth double-double of the season with 40 assists and 10 digs in the win at No. 23 Missouri. Kentucky’s Alli Stumler averaged 4.92 points, 4.17 kills and 2.67 digs per set and registered a .429 hitting percentage over two road wins for UK.